At the end of October 2018, the Deutsche Ultraleichtflugverband e.V. 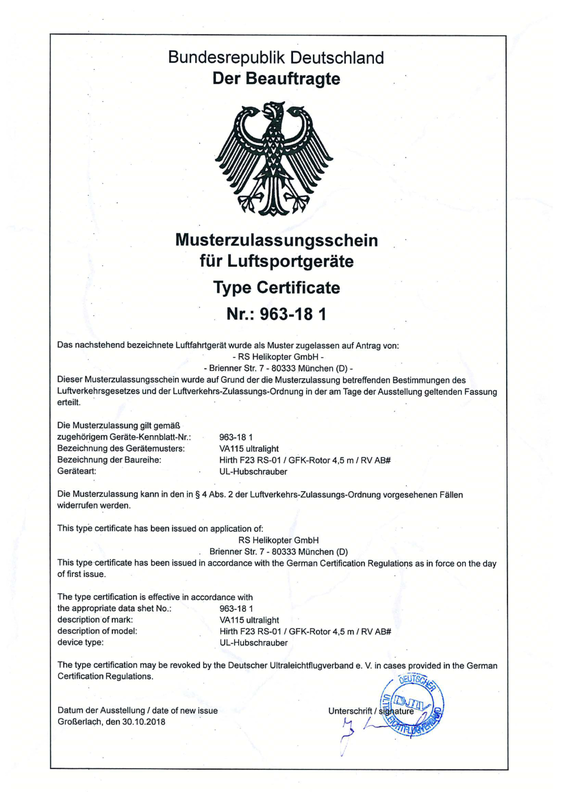 (German Ultralight Aviation Association DULV) granted RS Helikopter GmbH the Type Certificate for the coaxial helicopter RotorSchmiede VA115 ultralight. RS Helikopter GmbH starts selling the RotorSchmiede VA115 ultralight and will deliver the first helicopters in time for the 2019 season. For a net purchase price of 80.000,- EUR, pilots have the great opportunity to fulfill their dream of flying a real helicopter. This is a major achievement in the Ultralight Helicopter Category. Never before has helicopter flying been so affordable and safe. With the new generation coaxial rotor system – patented in USA and Italy already – eliminating the requirement for a conventional tail rotor, the new RotorSchmiede VA115 ultralight is a very safe helicopter. The autorotation characteristics of the co-axial rotor system coupled with innovative design features like the new freewheel unit, centrifugal clutch and blade locking system are all important measures towards safer flight operations. As a full-fledged helicopter with outstanding flight characteristics, the RotorSchmiede VA115 ultralight positions itself clearly above the gyrocopter scene. Due to its low empty mass and the performance of its coaxial rotor system the single-seat RotorSchmiede VA115 ultralight has an outstanding payload of 121 kg. The innovative coaxial rotor system of the RotorSchmiede VA115 ultralight offers outstanding handling and autorotation qualities, stable flight characteristics, compact dimensions and fuel consumption of only 16 l/h in cruise. The noise emissions of the RotorSchmiede VA115 ultralight are only half of other helicopters and are at a similar level to current gyrocopters. Also noteworthy is the thermally unlimited hovering time with which the RotorSchmiede VA115 ultralight stands out clearly from the competition. In a very short time – the new airworthiness requirements for ultralight helicopters (LTF-ULH) became effective in December 2016 – RS Helikopter has been able to successfully complete its maiden flight in March 2017. Certification of the RotorSchmiede VA115 ultralight was completed in less than two years. With the optionally available VA115 trainer, the helicopter is ideally suited to significantly ease the first steps in helicopter flying: The training platform can be easily attached to any RotorSchmiede VA115 ultralight. The degrees of freedom of the individual movements can be adapted to the learning progress of the trainee until he moves freely with his helicopter in a maximum height of 1.50 m. To pilot trainees the training platform offers a cost-effective and safe method for gaining first experience and for practicing the coordination of the individual control inputs. The RotorSchmiede VA115 ultralight combines safety, fun and cost effectiveness in a new category of professionally built helicopters and is targeted at the sports leisure market globally at a net purchase price of 80.000,- EUR. RS Helicopter is now accepting orders for the RotorSchmiede VA115 ultralight and the optional VA115 trainer. However, the RotorSchmiede VA115 ultralight is only the kick-off to the development and production of RotorSchmiede helicopters. Already under development, the two-seat, enclosed RotorSchmiede VA250 ultralight will revolutionize the helicopter market with its flight characteristics, unrivaled payload of 250 kg, space to allow both passengers to load carry-on luggage, and its target price of 150,000 EUR net. The RotorSchmiede VA250 ultralight is due for delivery to customers in 2020. RotorSchmiede is a brand of RS Helikopter GmbH. Headquartered in Munich, Germany, RS Helikopter develops at its branches in Wesendorf and Magdeburg light helicopters, all featuring RotorSchmiede’s patented coaxial rotor system. RotorSchmiede pursues an incremental strategy, basing future unmanned products with alternative propulsion systems firmly on the experience gained developing ultralight manned products. The RotorSchmiede VA250 ultralight will be able to carry two passengers inside a weatherproof cabin. Currently the first prototypes are being assembled and – following RotorSchmiede’s proven test procedures – will enter certification soon. With a target price of 150,000 EUR net the RotorSchmiede VA250 ultralight will excel with its exceptional hover performance and payload capacity. Future UAS versions (unmanned aircraft system) of VA115 and VA250 will create new possibilities in industrial and commercial applications. Companies that are interested in developing industrial solutions together with RotorSchmiede are welcome to contact RS Helikopter GmbH.